We have been locally centered in Ontario, CA. Just pick up the phone and our team will reserve a bus for your next trip. Our online reviews and testimonials describe the safety precautions our drivers take to keep our passengers safe. For more info just call! Regardless of it's across town or around the country, organizing transportation for a big group is no easy task. Fortunately, the trusted group transportation experts at Carreras Tours are here to assist. We are professionals when it comes to the complex logistics of group transportation. From organizing to execution, our team is standing by to help you make your next special event a success. With our luxurious fleet of large-capacity motor coaches and seasoned drivers, you can rest easy that your passengers will have a safe, enjoyable ride when you choose Carreras Tours. For over 10 years, our Chino-based charter bus rental company has proudly carried passengers throughout Southern California and around the country. Over that period of time, we have built a reputation for providing top-tier service at affordable prices. Unlike some other motor coach companies, our goal goes far beyond getting our passengers from point A to point B. We strive to make sure that all of our passengers enjoy a comfortable, safe ride on our luxurious travel buses. “Luxury” may not be the first thing that one thinks of when you think about charter buses. However, riding with Carreras Tours is truly a special experience. Most of our first-time passengers are happily surprised to learn about all of the comforts our luxurious motor coaches are equipped with. 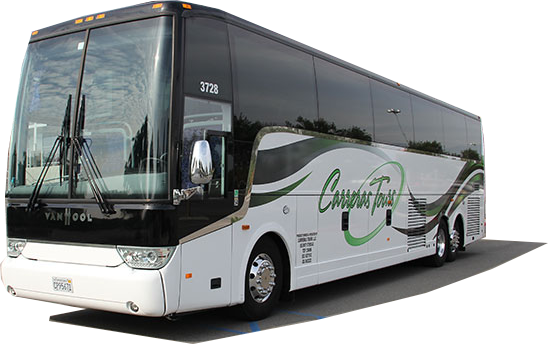 Our charter buses are available in a range of sizes including 49 passenger, 51 passenger, 56 passenger, and 57 passenger models. Onboard, you will discover everything you need to make your ride an enjoyable, comfortable experience for your entire group. Some of the features you will find aboard our motor coaches include a P.A. system, DVD players, and a state-of-the-art climate control system. Once you step aboard one of our vehicles, you will know that this isn't your average bus. No matter how short or how far your destination is, we believe that you should travel there in style and comfort. That's why we've gone the extra mile to make sure that our fleet of charter buses are packed with all of the special amenities you need to have a truly memorable trip. While many discount charter bus companies are very limited as to how far they can transport your group, Carreras Tours is happy to transport your party down the street or out-of-state. Over the years, we've helped countless clients plan long-distance trips for groups of all sizes. We understand the complicated logistics of coordinating a trip that takes your far from home, especially if you have to be responsible for a big group of people. Along with plenty of storage to safely guard your luggage, and tons of built-in features to help make your trip an enjoyable experience, our motor coaches are ideal for longer hauls. However, our commitment to our customers starts long before we take off. Our in-house planners will assist you map out the logistics of your trip ahead of time to make sure that everything is perfect down to the last detail. Your group trip is coming up soon. How are you going to get everyone to and from your destination safely and on time? Some trip planners look to carpooling or air travel to transport their group, but these options leave them wide open for group members to arrive late, get lost, lose their luggage, and more. These options also don't ensure that your group will travel together, completely defeating the purpose of a group outing. There are many instances where your company may need to book corporate transportation services. One of the most popular reasons why our corporate clients call on us is for airport terminal transportation. If you have a large group of employees who will be flying out for work at the same time, it makes sense to choose a trusted charter bus company to get them to the airport. Taxis and other car services can be unreliable and need your team to drive themselves to the airport take much more time and money as they have to find a secure parking garage and wait for a shuttle to their gate. When you leave the driving to Carreras Tours, you can trust that or seasoned driver will get your entire group to the airport on time and hassle free. Corporate trips and conferences are other popular reason why people call on us. Regardless of whether you need to shuttle your team to a local convention center or out of town, we can assist you coordinate and execute the details of your next big-group business outing. Our state-of-the-art motor coaches are clean and packed with amenities that will enhance the trip experience for your entire group. Organizing a wedding is an exciting time, but it can also be very stressful. Hiring a professional wedding bus is a great way to give yourself some peace of mind on your big day and during all the various events leading up to it. Everyone looks forward to having a great time at a bachelor and bachelorette party, but the logistics of getting everyone in your group to your destination or destinations throughout the night can be complicated. How many cars will you need and who will be responsible for driving? Let Carreras Tours be your designated driver so you can focus on celebrating with your friends and loved ones! When the time comes for your big day, the last thing you want is to worry how you, your groomsman, bridesmaids and other important guests will get to your wedding venue. When you hire Carreras to shuttle your wedding party on your big day, you can rest easy knowing that you can ride to your venue in comfort and on schedule. After the festivities have concluded, we can take everyone safely back to your hotel or other designated location. Securing a charter party bus will not only give you peace of mind but will also enhance your guests experience on your big day. If you are a teacher, club, or youth sports leader, you know how challenging it can be to plan a group trip. If you find yourself in need of group transportation for a large number of children, you want to take special care to hire the safest, most seasoned charter bus company in the area. The seasoned drivers at Carreras Tours have the experience necessary to get you and your young passengers safely to your destination. Regardless if it is a field trip or a basketball game, you can trust that our drivers will get you there on time. Our charter buses are packed with amenities that will help your youth trip run smoothly. With DVD players to keep your group entertained and a climate-control system to assist keep everyone comfortable, all you have to do is sit back and enjoy the ride. Perhaps you're visiting from our out of town or maybe you're a local that wants to explore some tourist attractions without the hassle of driving. Carreras Tours can assist you plan a custom itinerary of some of Southern California's top attractions including theme parks, museums, and more! Our organizing services are perfect for families or groups of 20 or more. There's no need to worry about taking multiple vehicles, finding parking, or fighting traffic. Simply leave the driving to one of our friendly drivers and sit back and enjoy your time with your family. If you have a longer road trip in mind, we can assist you with that as well. Talk to one of our knowledgeable planners about your next out-of-state trip. Treat your entire family to a trip to a National Park or make that long-overdue trip to visit your family in another state. With available amenities like an onboard restroom, DVD player, reading lights, and more, you will enjoy the journey as much as the destination when you ride with Carreras Tours. Carreras is proud to employ only the most experienced drivers in the business. From airport traffic to a cross-country road trip, there is nothing that our drivers can't handle. Our team is committed to making sure that your group has an enjoyable experience with us. That's why so many of our private and commercial clients continue to use us for the transportation needs year after year. When it comes to large group transportation, no one beats Carreras Tours in price, experience, and flexibility. Our large fleet of state-of-the-art motor coaches can handle groups of all sizes. And our experienced drivers are able to safely transport your group no matter how far your destination is. The next time you need an affordable charter bus for your private or corporate event, call on the #1 motor coach company in the area. We look forward to serving you!